The Micro 80 was first designed by a Russian amateur radio operator Oleg Borodin (RV3GM). After this it became open season for amateur stations building small transceivers. It was this design that lead to the pixie transceiver. The Micro 80 was the first transceiver I have built. 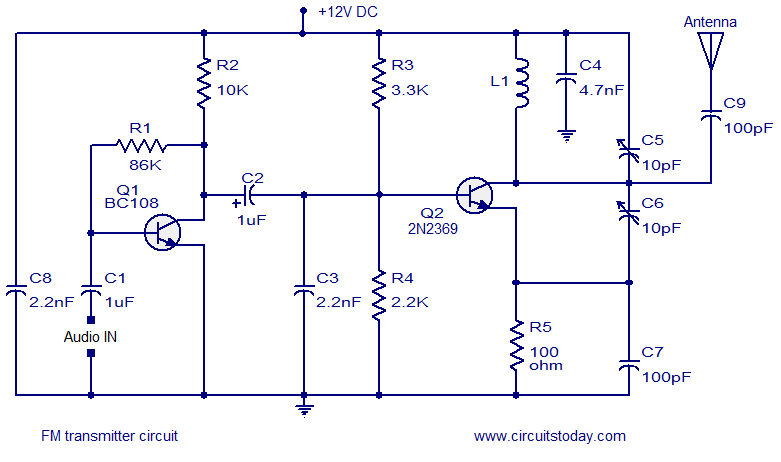 A very simple two transistor amp circuit which can be use in any place where a little amplification of audio is required. This simple transistor amp is built around two BC108 transistors and few components. A lot of FM transmitter circuits have been already published here. This just another one, a simple two transistor FM transmitter.